It’s a daring subject in this era of widespread fear of radical Islam, to seek similarities between that religion and Christianity and Judaism. In fact, viewers might have shared the tiniest start to read Wohl’s categorization as “the Abrahamic religions” — we Judeo-Christians don’t usually think of Islam as our sibling, although it reveres the Old Testament, regards Jesus as a holy man and sprang from the same tradition. 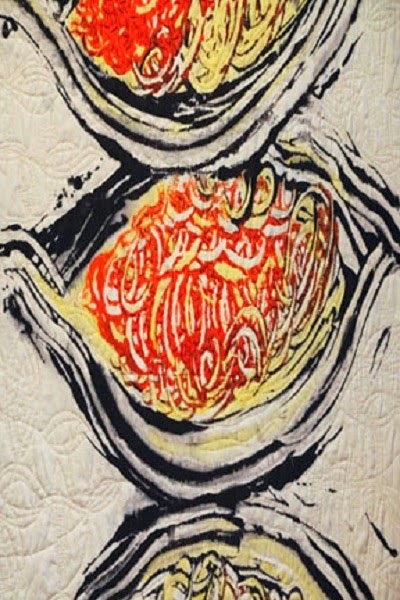 Wohl’s works in this series make extensive use of calligraphy, mostly Hebrew and Arabic scripts, and also repeat the imagery of a veil, through her signature “unweaving” technique. 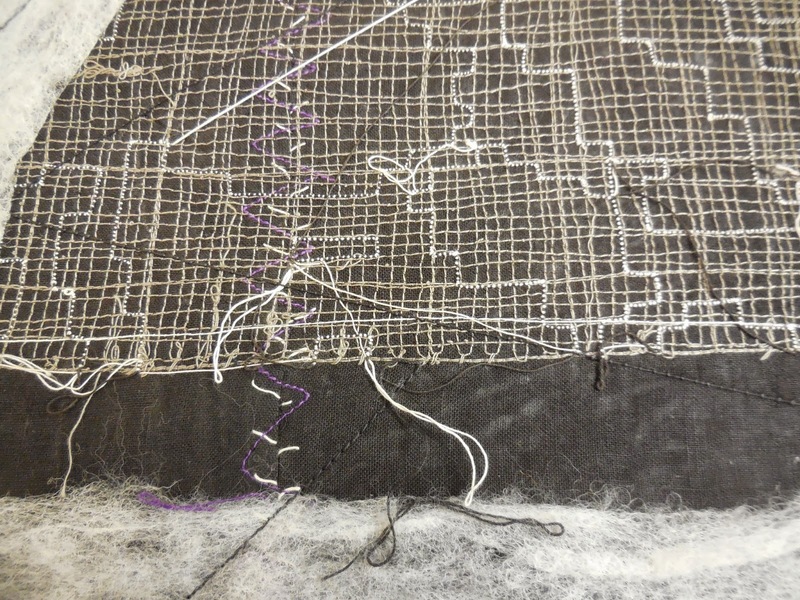 Working with a heavy canvas, she slices either the warp or weft threads around the edge of a shape, then unpicks the weave to leave the other strands loose. 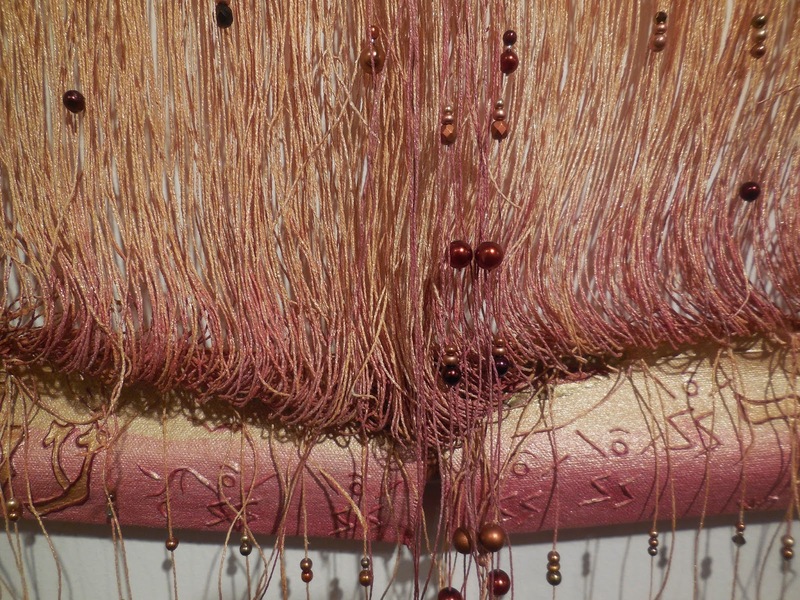 Because the weaving process puts a lot of crimp into the strands, when they’re set free over a long distance they’re significantly longer than the woven part of the canvas, so they droop and/or bulge. I missed the gallery talk so I didn’t learn how Wohl achieves the sharp raised edges on her letters and shapes. 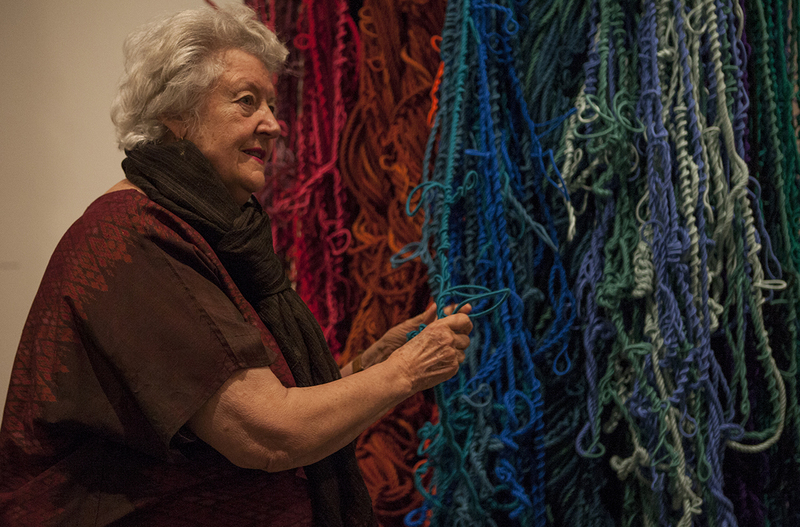 I could tell that she painted the “unwoven” strands of her canvases and often strung beads on them. Sometimes she sliced the free strands at the top of the shape so they would hang down below the unwoven area. Usually she removes the horizontal threads and leaves the vertical, but not always. 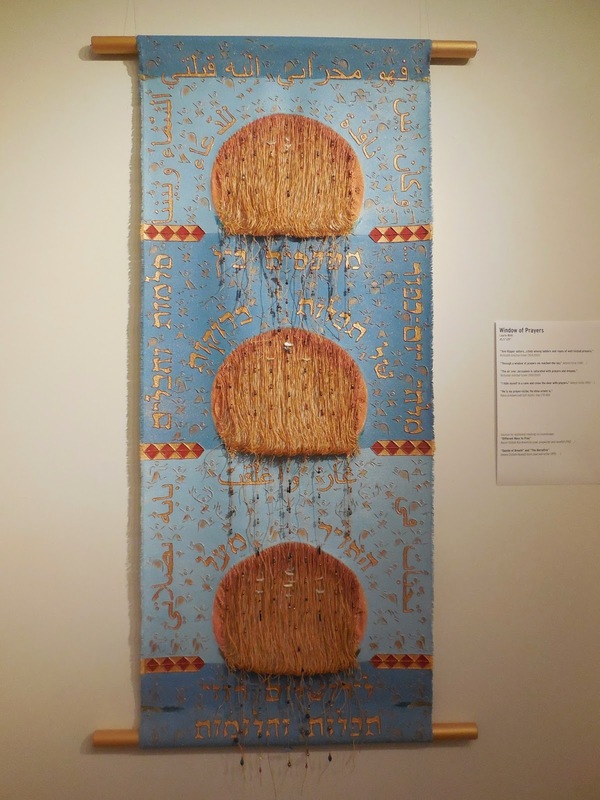 I’m always intrigued by art that uses text or letterforms, and though I read neither Arabic nor Hebrew, I could tell that Wohl’s calligraphy is exquisite. The works have a solemn presence as well as a bright and lively sparkle. The show was well worth a visit. I’m cross-posting this to my own blog, Art With A Needle. Please stop by and visit me some time! Why did this piece call out to me so loudly? I love grids, and I love dense machine stitching, and I love old-fashioned typewriters like the one used to type Lupas’ name and address on the interfacing. But what I really admire is the supreme confidence of an artist who can put such humble materials together — the edges are secured with staples! — and make them stand up straight and proud. The panel stood out from the others — not pretty, not earnest, not awkward or amateurish, despite its seemingly haphazard construction. It’s the only one I’ve seen so far that strikes me as art rather than as decoration. I had never heard of Ana Lupas, but some research reveals her to be 75 years old, still living in Cluj, Romania, where she was born. 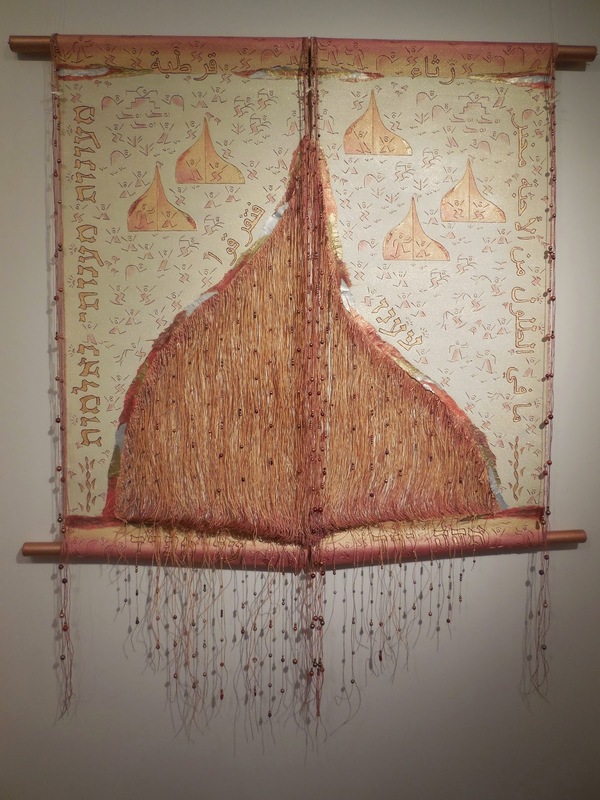 She started her art career as a tapestry weaver and was exhibited in all the major shows, including several times at the the Lodz Triennial, where she won Gold and Silver medals in 1979. She expanded her work to installations and happenings, especially outdoors where she was among the earliest Land Art practitioners and strongly influenced many of her fellow artists in Eastern Europe. She would enlist people from villages to construct wreaths, towers and other forms from straw, then leave them outside for years to weather and disintegrate. 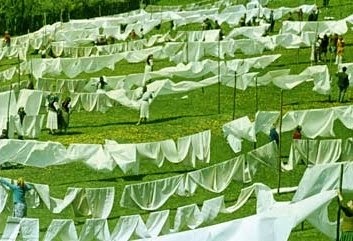 Predating Christo’s Running Fence, she had 100 women help her cover an entire hill with clotheslines of wet linens. I was unable to find more information about Lupas and her recent work, even by painfully reading Google translations of art criticism from the Hungarian. I found an artist statement that somebody else had translated into English, but it left most of its meaning behind. She talks about art having “to contribute, to shape, and to give new dimensions to the social existential universe,” whatever that means. 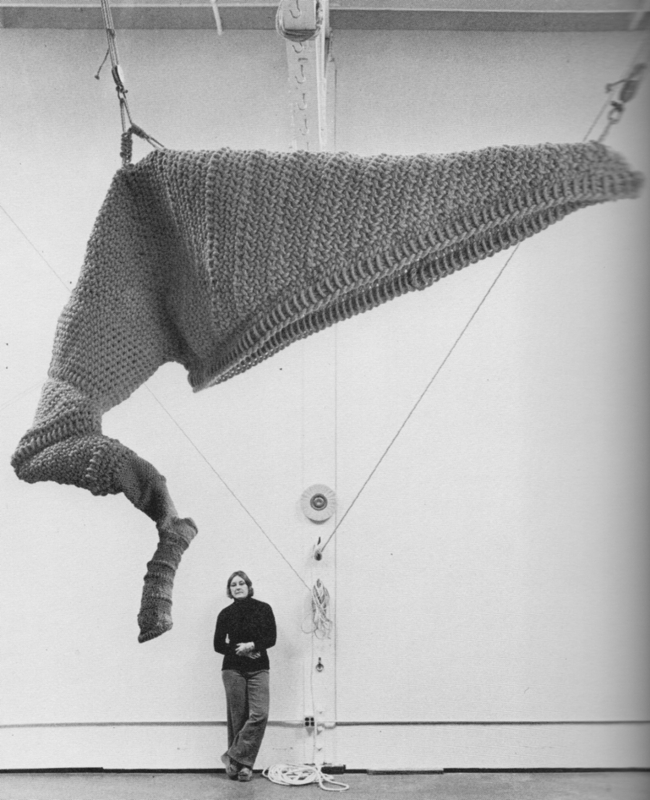 She has no website, and I could find no images of her early tapestry work, predating the internet. I’m afraid she will remain a mystery to me; her work calls out to me across the years but leaves me hungry for more. It is a truth generally acknowledged that artists must suffer for their art. 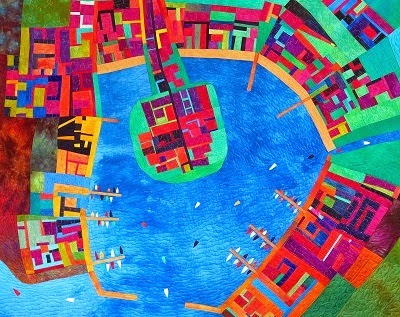 Also, it is widely believed, in the art community at least, that good art has its basis in the artist’s unique personal experience – and, especially among artists and critics, that a viewer is needed to “complete” the work, in that they will bring their own experience to their perception of the work. In “Black & Blue”, an exhibition at the Freespace Gallery in Kentish Town Health Centre, London , two artists have taken the notion of “suffering for their art” to great lengths. For Chris Day, it is voluntary; for Penny Clayden, it is inescapable. Chris and Penny are familiar with suffering and pain through their work – Chris is a respiratory therapist, treating cardiac patients, and Penny is a nurse, now training other nurses how to look after their backs, for she has long had chronic back pain herself. They are both nearing the end of their art MA at Farnham, brought together by their medical background and their search for how to integrate their creativity and these concerns with pain, suffering, healing, harmony, natural rhythms. As well as their working lives in health care, they share textile-related backgrounds and families in which people were always making things, by sewing or otherwise. Chris’s family included tailors and pattern testers; her father and grandfather stitched tapestries. Penny’s forebears worked in couture and costume making; she was given a sewing machine at the age of 4 and was making clothes for people, that they wore, by the age of 8. With this emphasis on clothes and cloth, stitched creativity, it’s no wonder that they are both undertaking a textiles MA. For Penny, sewing and art have been an adjunct to her working life; some years ago Chris took time out from work for a textiles degree. At the MA level, each student’s experience starts from the project they propose on applying to the course – they have already narrowed down the possibilities to something relevant and absorbing for them. During the course, tutors and mentors help them focus even further, as well as broadening their wider view. It is here that individual experience becomes so important, not just for finding a process of making the art but also in determining the content of the artworks. Night Waves (2013) Chris Day. Acrylic ink, sea water. Chris’s focus is on the interaction of man and nature over time, and the work she shows originates in her relationship with the sea. 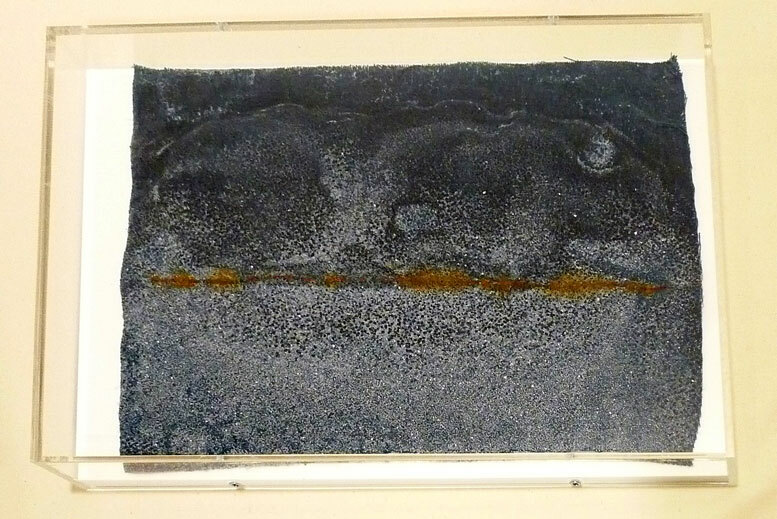 She has used ink and seawater to produce a series of drawings, often through wetting the drawn lines by taking the paper into the breaking waves. She works at the seashore throughout the year, and has also drawn while immersed up to the neck, unable to see the drawing on her board through watching for the next wave so that she can jump to stay above it. Intervention 1 (2013) Chris Day. Linen, pre-rusted wire, sea water. 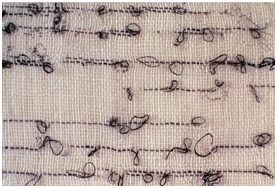 Her stitched work doesn’t imitate surgical sutures – surgical procedures are presented in a more abstract form, for instance in “Intervention 1” by the incorporation of wire into a linen cloth that sat in evaporating sea water for more than a year, rusting the metal and precipitating salt crystals as it dried. Chris also makes felt pieces, using her hands intuitively through long practice with this process, just as she uses her hands intuitively in her work, the intuition developed through years of experience. 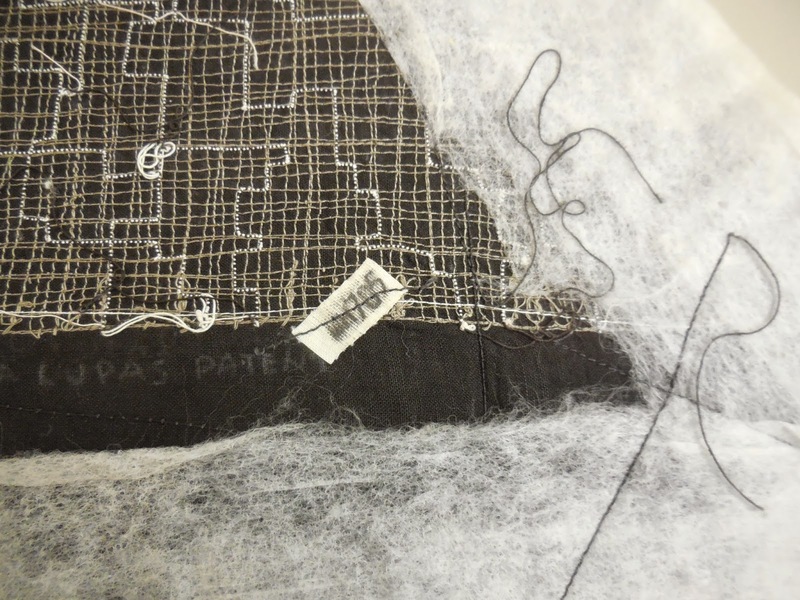 Redacted Revealed (detail) (2014) Penny Clayden. Silk organza. Everyone who suffers pain sees it differently, say Penny – her own pain is black – and it was this interest in perception of pain that led to her MA project, which was initially to discover other people’s perceptions of pain. She found, though, that she didn’t understand her own perceptions, so has narrowed her focus to her personal experience. 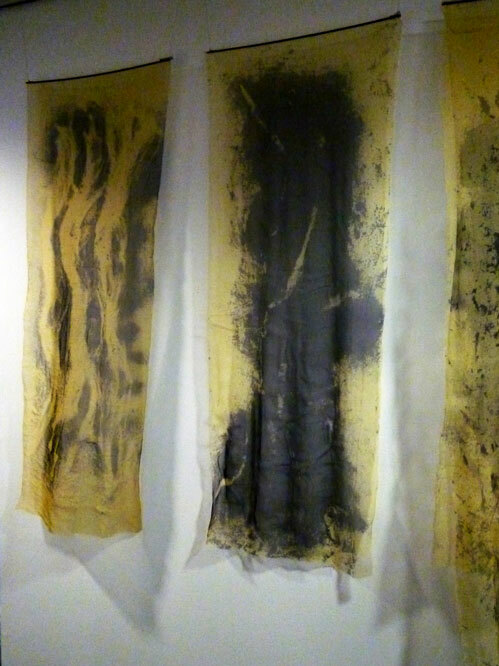 One of the resulting works, Redacted Revealed, is a series of prints on freely hanging silk organza, a fabric that had been used inside plaster casts to prevent rubbing from damaging the patient’s skin. 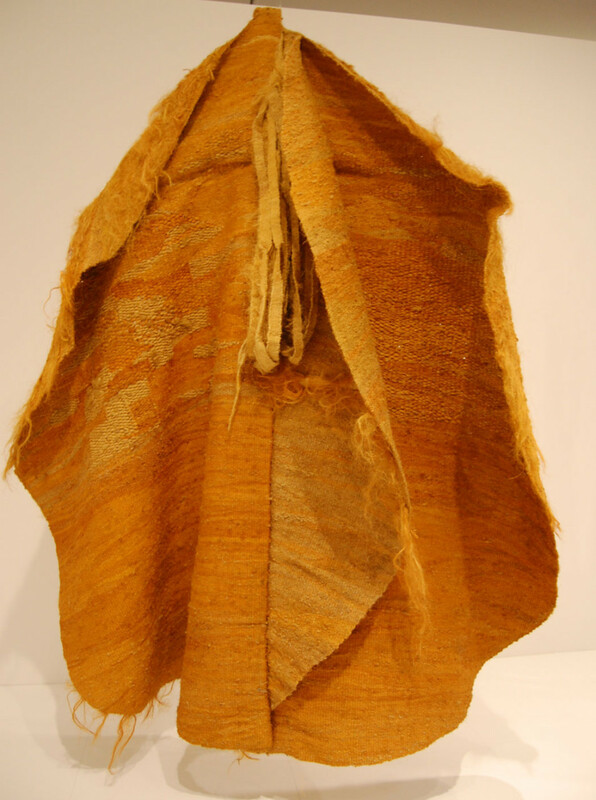 The fabric is stained with myrobalans, which as well as being used in tanning leather in India are made from trees that have healing qualities. Hung around a large space, the series of prints represent a day in the life of Penny’s pain, which changes over time and throughout the day. 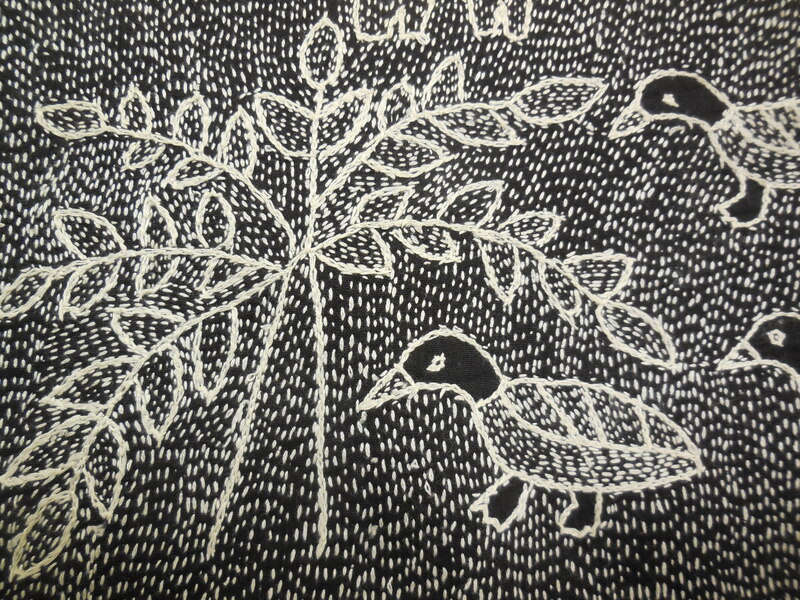 The shapes on the cloth bear some resemblance to structures found on x-rays; some cloths are double, and move across each other in the air currents as people walk past. 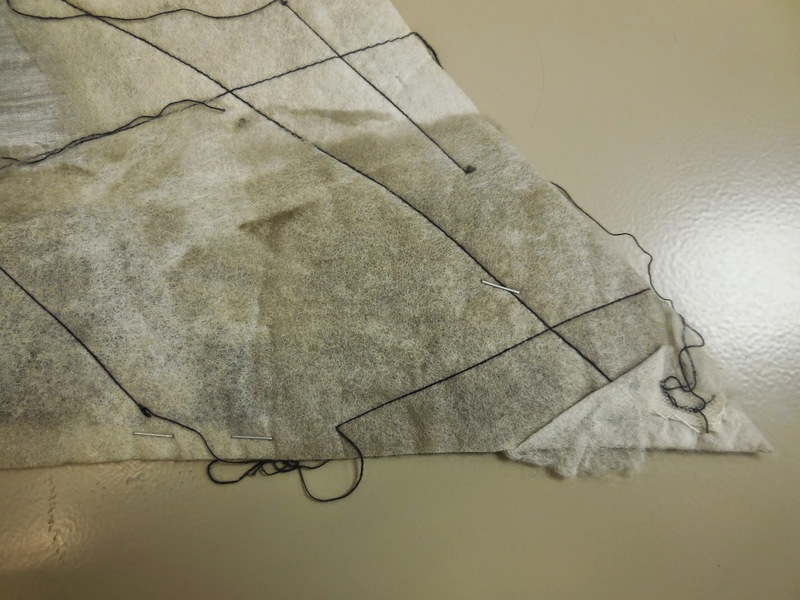 Other fabrics used in the medical setting include calico and gauze, bandages and garments, and Penny has dipped these into black porcelain slip. The fabrics are burnt away during firing in the kiln, leaving the hard, but fragile, porcelain; even when the pain goes away, Penny says, she can feel very fragile. 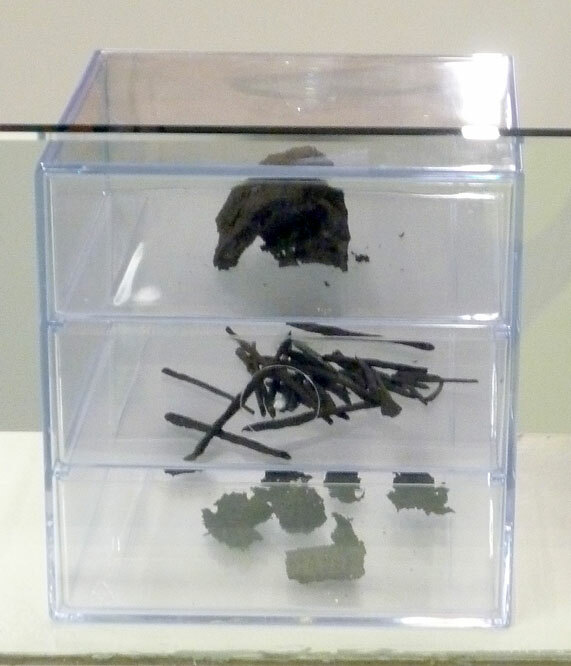 Penny is aware that these fragile works are likely to disintegrate through handling, so for the life of the exhibition she has put them in drawers and in jars sourced from office and kitchen suppliers. The jars resemble those used for anatomical specimens, with no need for the formaldehyde preservative. 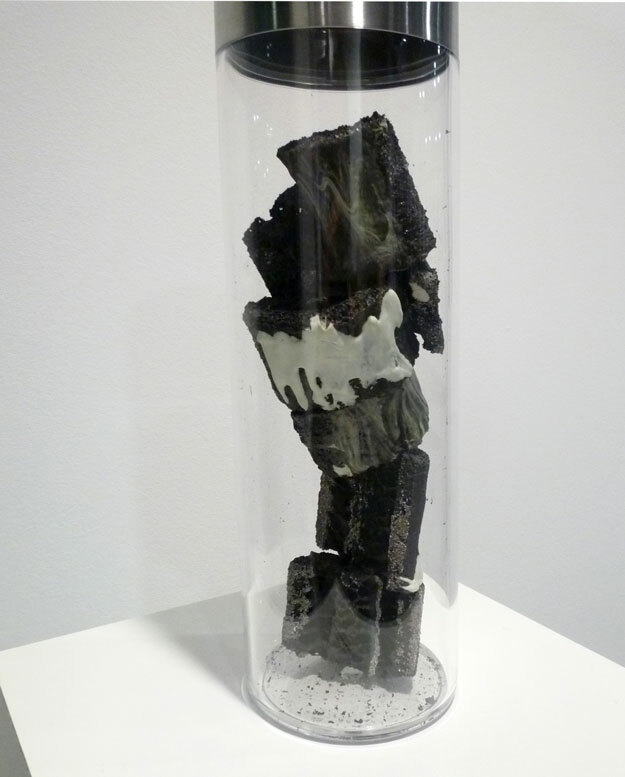 The tallest jar holding pieces of her Fragmentation series contains porcelain-dipped pieces of loofah– the soft, spongy shapes, made rigid, resembling vertebrae in various stages of decomposition. These visual ways of explaining pain were well received by patients who happened to be in the health centre while the show was being hung. One said that this reminded her that people outside the health setting were caring for her in a different way; another, who had been looking very dejected, seemed revived by the activity around him. The arts in healthcare settings are acknowledged as contributing to patients’ welfare and recovery, and enriching the lives of staff and visitors. A literature is building up on the active use of art in hospitals and health centres, not just traditional pictures as something to look at while waiting, but as part of signage and for orientation within the building; as a focus for conversations between visitors and patients; making the building interesting for children; introducing the healing benefits of nature; and involving patients in creating art themselves. Funding for such art is usually from private and charitable sources. In both art galleries and health centres, space is becoming more fluid – used for different purposes by different groups of people – for example, to meet for coffee rather than look at the art, or to see the art rather than attend a medical appointment. The gallery at Kentish Town Health Centre is not separate from the treatment areas. It shows art that can be comforting, or can present a challenge to the viewer. When the art is based in an experience that patients can relate to, even a difficult experience like pain, it is their own experience, their perception and recognition of that commonality in the art work, that makes the work complete. 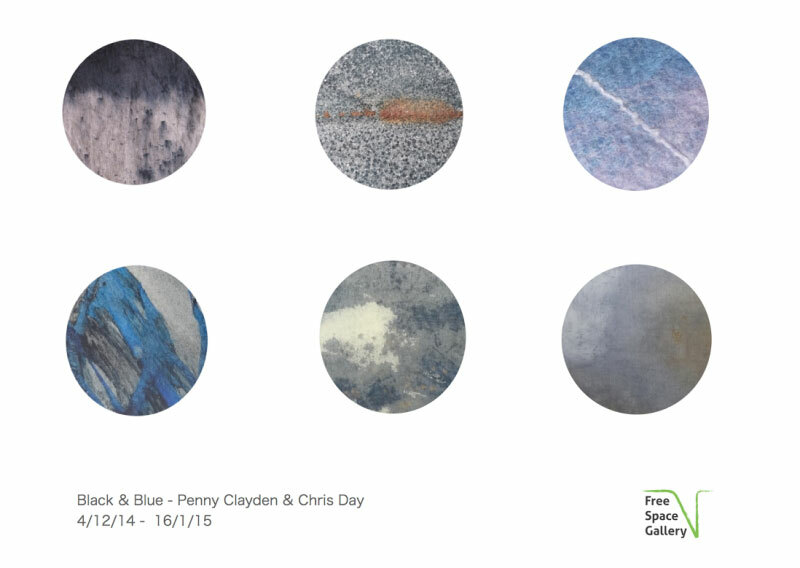 Black & Blue is showing at Free Space Gallery, First floor, 2 Bartholomew Road, London NW5 2BX, until 16 January; see freespacegallery.org. 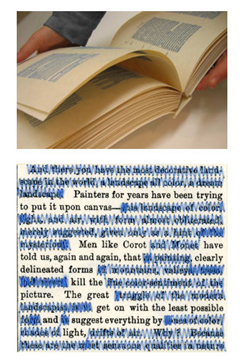 Artists who alter books by using their contents, rather than making books from scratch and filling them with their fresh ideas, have a material starting point: a physical book, or its text and/or images. 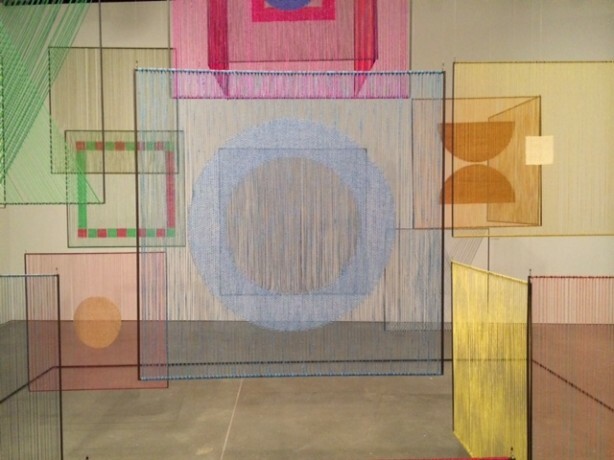 This post deals with three artists (one Canadian, one American, one British) whose theme is to explore the ambiguities of communication, and who use textile techniques to alter texts. 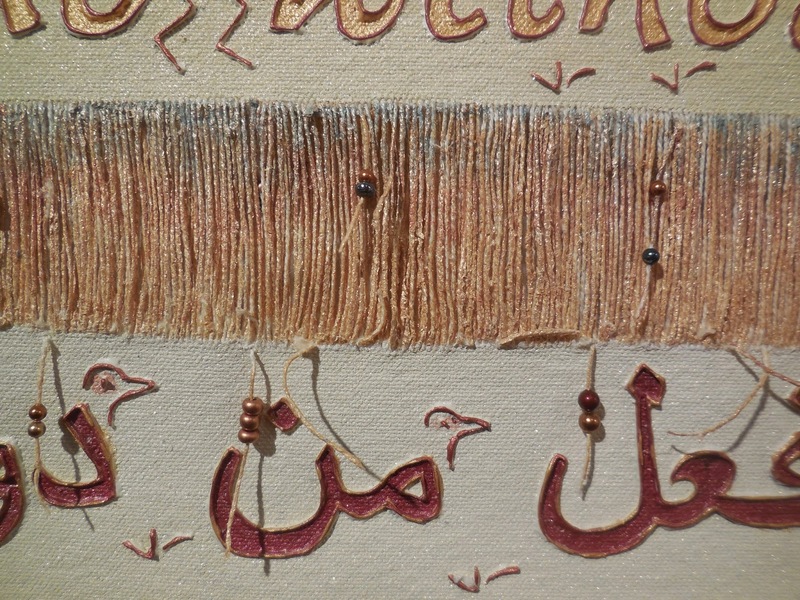 An experienced weaver, she removes threads from fabric and adds simulated script. 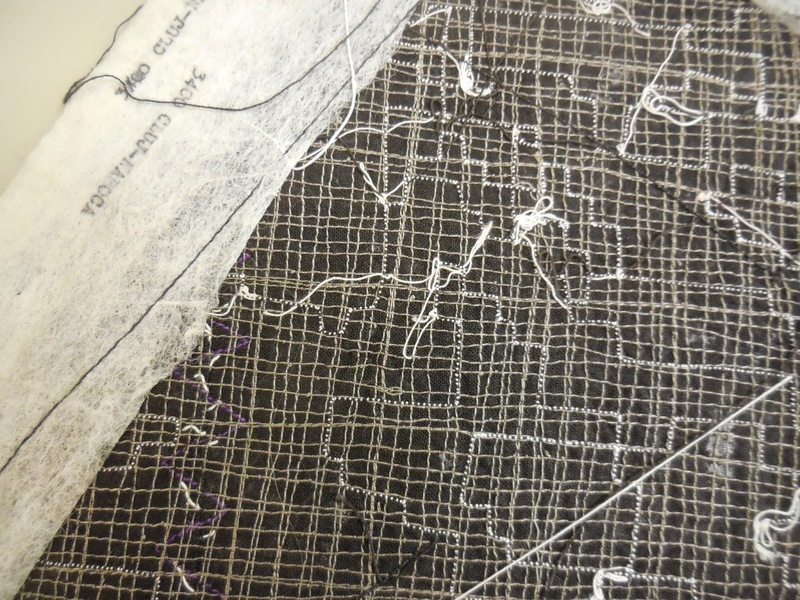 Plucked, ink-stained, and distorted “weave structures” become word shapes. 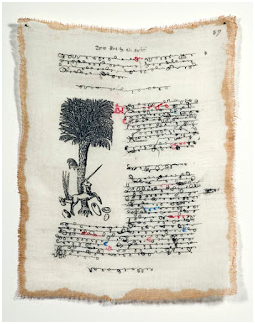 For this image, from a 2008 exhibition called The Unicorn and The Date Palm, based on renaissance herbals, she used heat-transfer to add the illustration after the thread “writing” is in place. 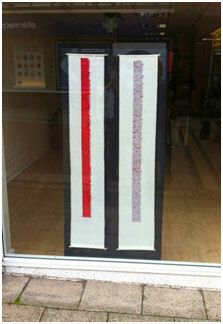 At other times, she has used inks, or coloured threads. 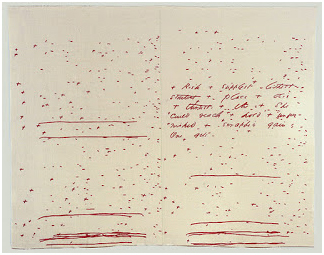 In “Commentary”, a 2004 exhibition at the University of Toronto’s Thomas Fisher Rare Book Library, she slipped between the pages of a number of the library’s rare books her own “pages” of abstracted, text-like shapes carefully woven into sheets of gauze. You can see from the image above (via) how they mimic the ancient pages of the real tomes. 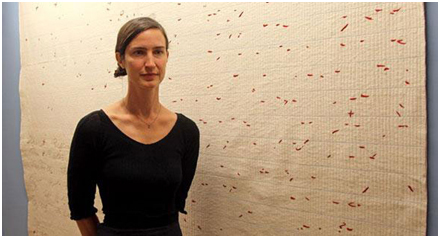 Sylvia Ptak says she is interested in “the multiple meanings that texts generate” – the incomprehensible language of her texts reads like everything and like nothing. “We have such faith in the printed – or handwritten – word that we feel it must be saying something,” said the reviewer of her show in the Globe and Mail. 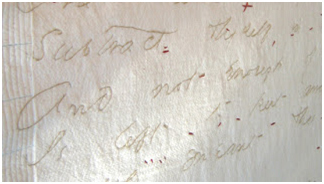 The “handwritten words” are something other than text – they are drawing, literally, in that a thread is drawn out of the fabric. 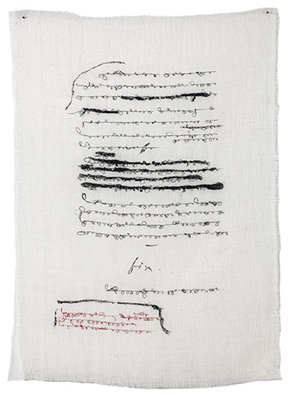 Her new body of work (2013) is inspired by manuscript pages, handwritten and extensively edited, by authors including James Joyce, Marcel Proust, and Virginia Woolf – pages that bear witness to their creative process, showing additions, deletions, and corrections. 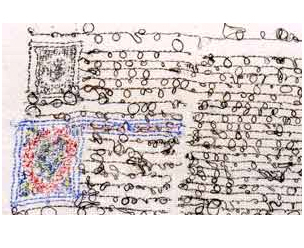 As well as gauze, Sylvia Ptak has been using a variety of paper, such as vellum and player piano rolls, to translate manuscripts into gestural marks, which although not legible, still retain the essence of each author. 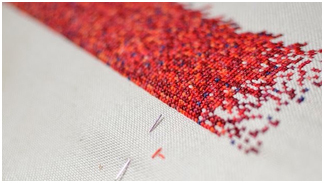 Jen Bervin has removed words, rendering the remaining text in stitch. 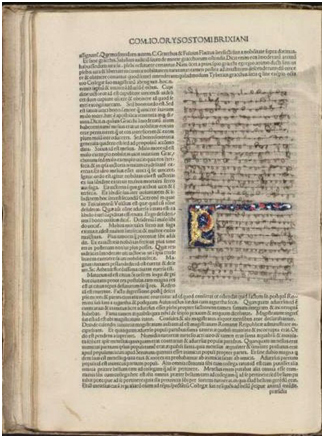 These marks were omitted from typeset poems and only became available to scholars when a facsimile edition of the poems was published. Since then there’s been a lot of literary theorising about them. She spoke about her poetry and how her work is made in 2010 at writing.upenn.edu/pennsound/x/Threads.php; you can listen online. “The Desert” was created as an editioned work, for which she hired sewers via Craigslist; they worked shifts in her apartment on as many sewing machines as she had available. 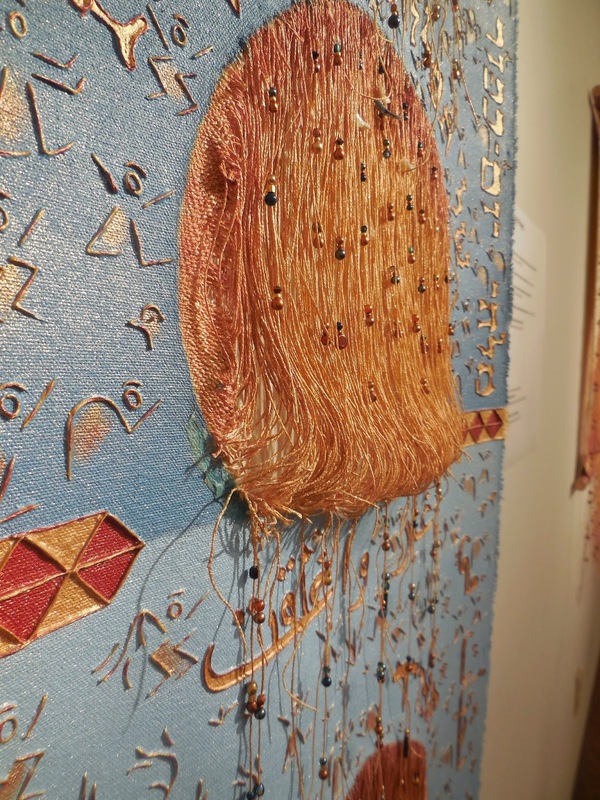 “The Desert” uses stitch to erase passages of text, making a new meaning with what remains. Jen used a text erasure technique in “nets” to make new poems out of Shakespeare’s sonnets – see an excerpt here. 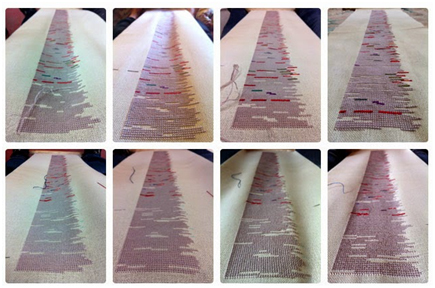 Sylvie Killgallon is “translating” Homer’s Iliad into coloured stitches. 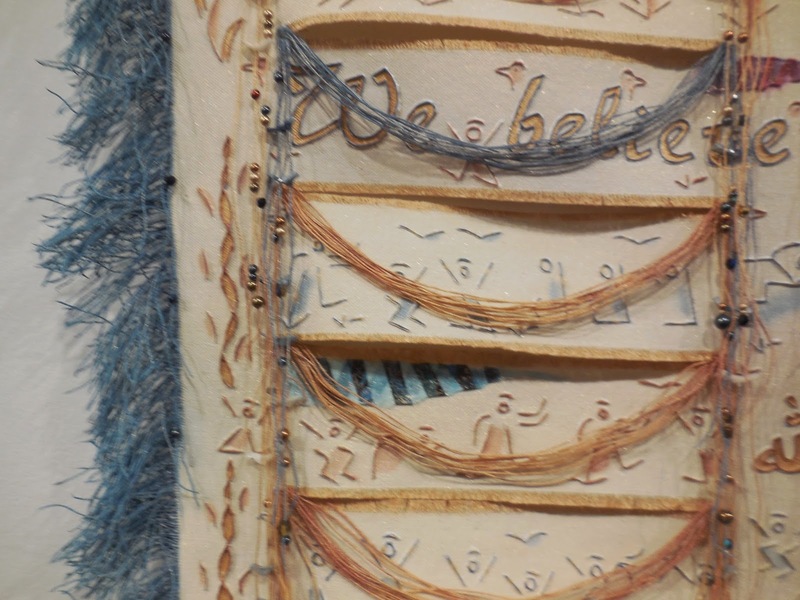 Each greek letter will be a stitch (a cross-stitch), with colours changing throughout the books, starting with red and moving letter by letter so that the final book is blue. Book 1 – of the 24 books – is finished; she’s now working on Book 2, and it’s the longest book. 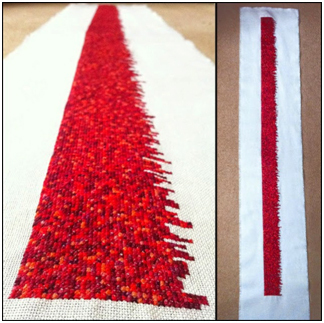 “I need to stitch faster” she says on the project blog, Stitched Iliad. “I started the project in response to a curator showing me a newly built, empty gallery space and asking me what I would put in it,” she said. The initial red colour scheme was inspired by the war, anger and bloodshed featured in the Iliad, which is believed to have been written between 750 and 650 BC. Research has shown that cultures generally follow a similar order in developing names for colours. Black, white and red appear first, while blue is one of the last colours to be named. The colours are to do with names of characters and their interrelation through family trees. Why quilts – rather than paintings … do you sometimes wonder? 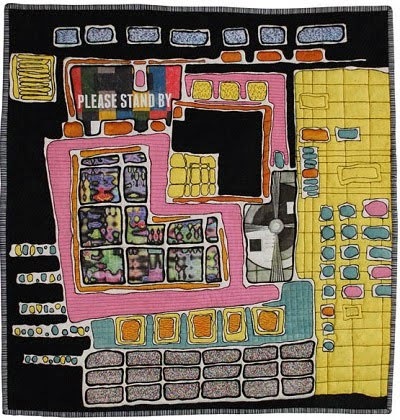 Whenever SAQA’s Art Quilt News pops into my inbox (you can subscribe here, it’s free) I ponder this question – the quilts shown in it are each part of an exhibition somewhere. Of course, seeing the work on screen is nothing like seeing it for real, whether its a quilt or painting or other medium … so the quality of the photography for what we see on screen is going to make a difference, especially for quilts, with the texture of the quilting often so very important in the design concept. The fabric is monoprinted, which at first made me think – “why not on paper” – but here the quilting adds that necessary something to complement and enhance the lines and colours of the print. 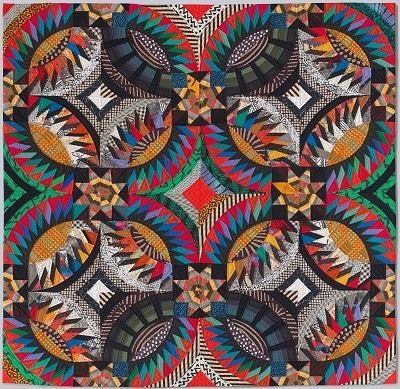 Nancy Crow‘s “Double Mexican Wedding Rings IV” (1988-90) could be a zingy print on paper, but this piece is “so quilty” because it comes right out of the quilt tradition – the blocks need to be pieced, not painted … fabrics, not hues, need to be used. Would you say much the same about this next quilt? 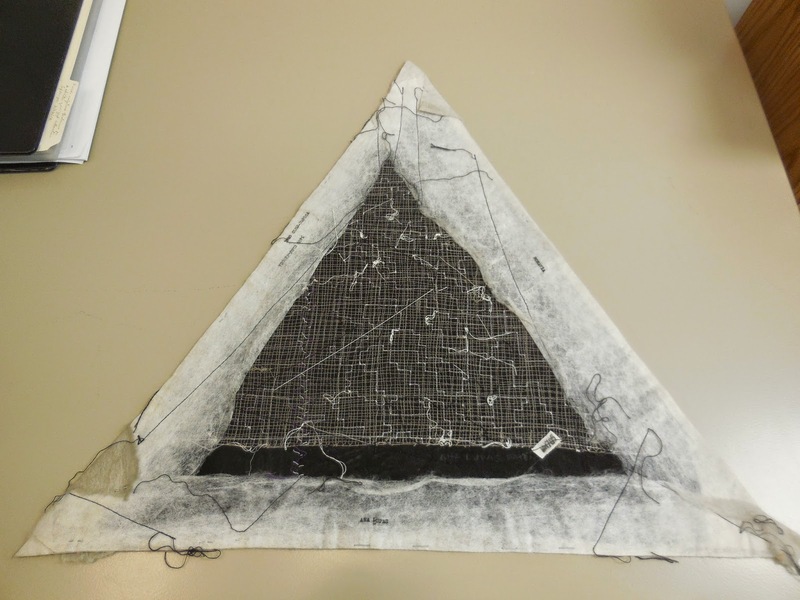 Does it need fabric and stitch to bring the design to life, or would it work equally well in paint, print, or collage? Quilted sea … that makes sense to me – the sea itself has a visible texture … but when it comes to quilted skies, what do you think – does the quilting evoke the feel of the wind or enhance the look of the clouds? Or are skies best left “just” painted? Photorealism on fabric is another stumbling block for me – it makes me ask “why?” Perhaps “because I thought it would be interesting” is good enough an answer? It seems to me that sometimes the use of fabric is either an indulgence, or else a power struggle: the materials need to be vanquished, they need to be bent to the will of the maker. There’s a further consideration, and I rather hesitate to mention it, but here goes…. What do you think – could it be that some people using fabric because they haven’t developed skills in other media? 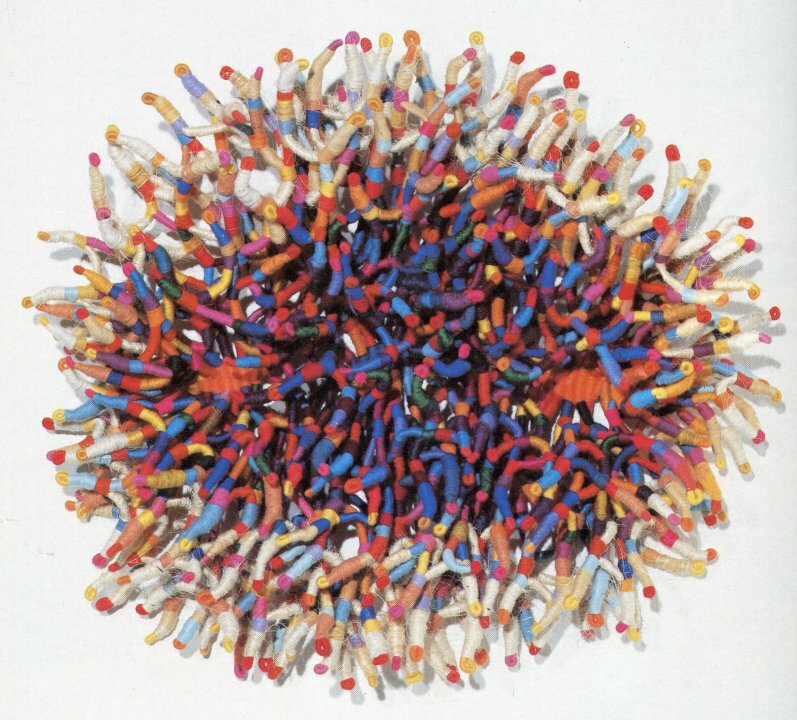 I wrote in June about Dorothy Caldwell, the internationally renowned fiber artist, who conducted workshops for my local fiber and textile art group. This time I’d like to focus on her use of the kantha stitch, aka running stitch, the most basic possible of hand stitches, the one we all learned when we first took up a needle in our hand. Dorothy joked that the reason she uses kantha so much in her own work is that she has never learned any more complicated stitches, but I’m not sure I believe her. Nevertheless, it’s a powerful mark-making tool. 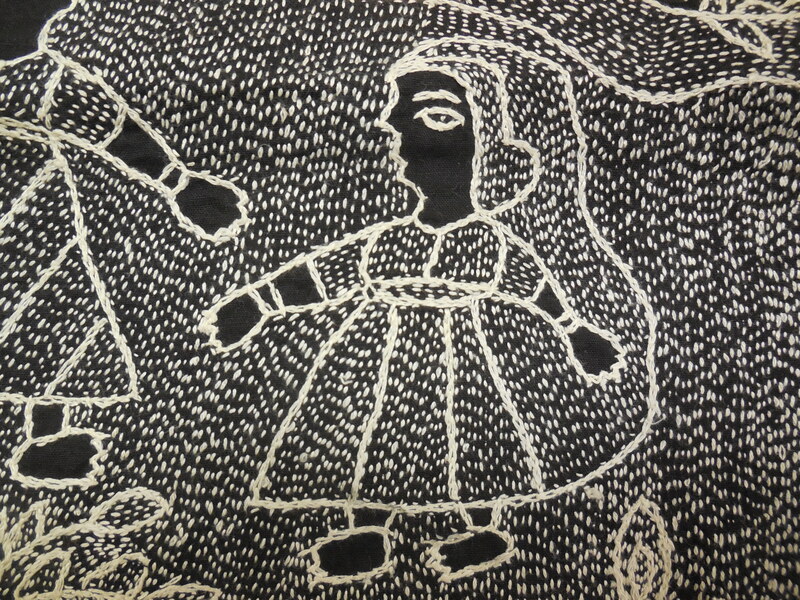 She brought several kantha embroideries that had been made by a cooperative of women in northern India with whom Dorothy has worked for several years. They make large pieces to sell in an effort to improve their village, and among other things have been able to build a meeting house in which to work and to clean up a lake that can now be used for fishing. One of the recurring motifs in the embroideries is a woman’s headdress that seems almost to be blowing away, billowing behind the figure. In fact, it shows a sari that is no longer draped over the woman’s face — as the women in this village used to dress when they were dependent and downtrodden — but is pushed back in freedom. 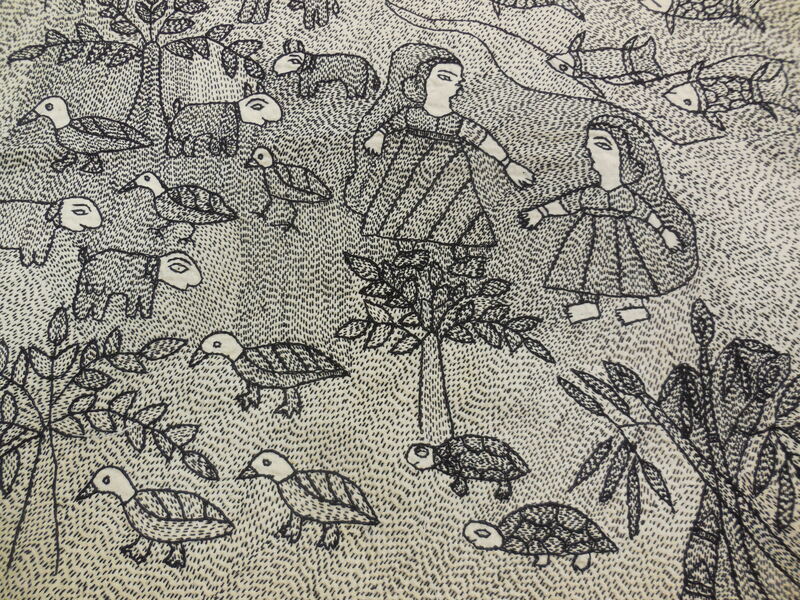 One or two of the women are in charge of drawing the cartoon onto the blank fabric, after which many women might work on the same piece. Popular compositions might be repeated many times but in different color schemes. 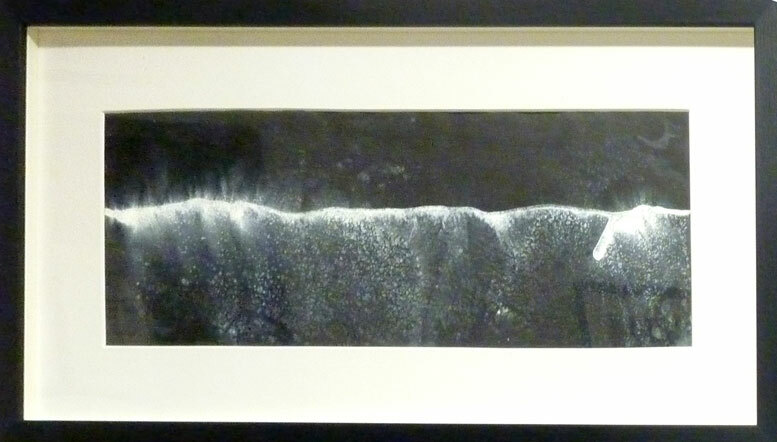 Here’s a large scene that was executed twice, once in white on black and the other in black on white. 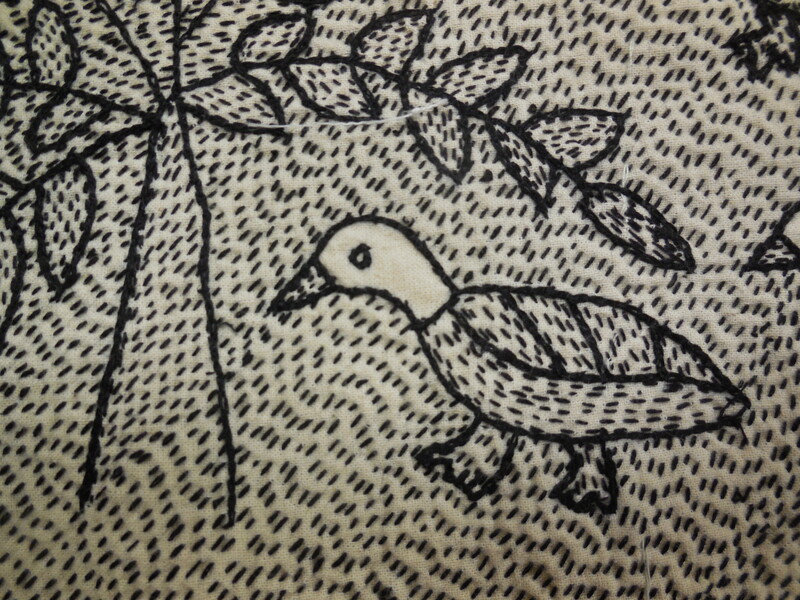 We didn’t have time in the two-day workshop to make any such elaborate embroideries, but we did spend enough time with the kantha stitch to see how it can be deployed in many different patterns and rhythms. 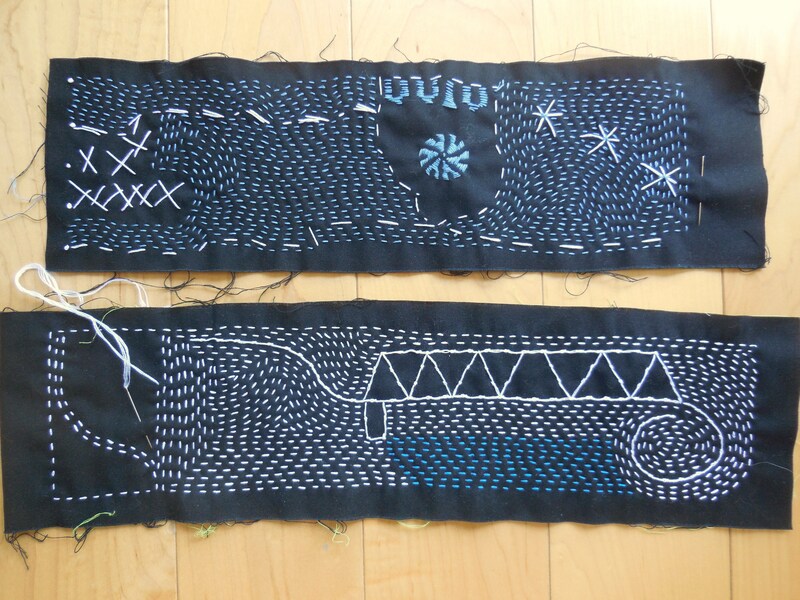 Here are my two kantha samplers, still in progress. I’ll definitely keep working with this stitch and learn more about how it works.